Native to Asia and Europe. Escaped cultivation and naturalized in North America. Disturbed areas adjacent to plantings. Full sun, shade intolerant. 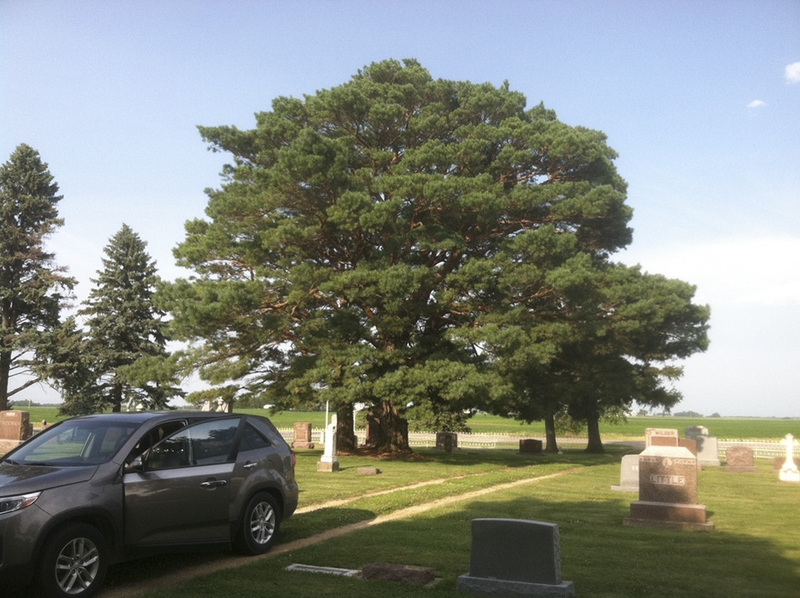 This is an evergreen, coniferous tree rising on a single trunk from horizontal roots and, usually, a taproot. 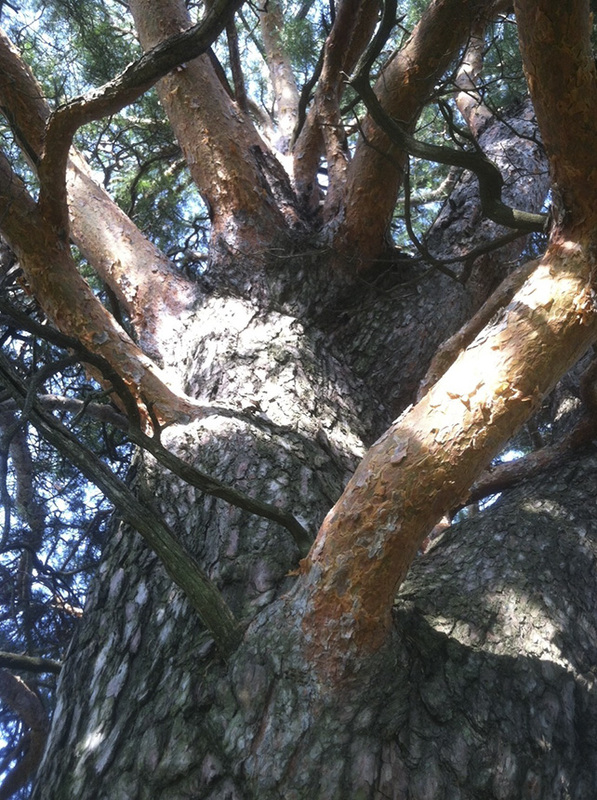 It is a Hard Pine. 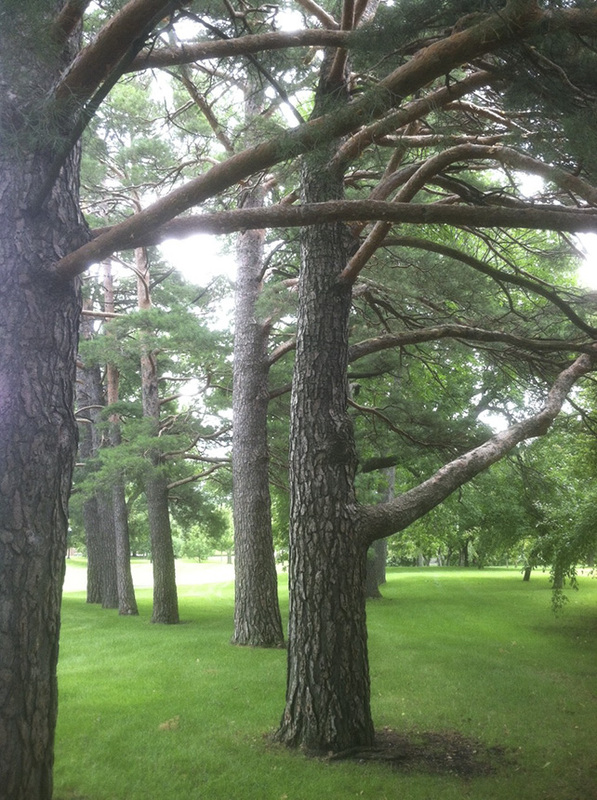 In Minnesota mature trees are usually 30′ to 50′ tall, though in favorable conditions it can reach over 90′ in height. 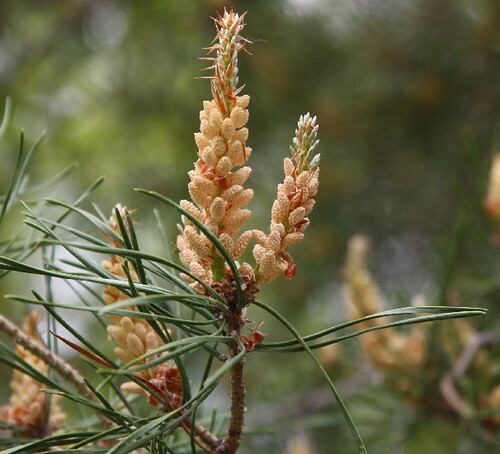 It is the most widespread pine in the world. Young trees are pyramidal in shape with a cone-shaped crown. 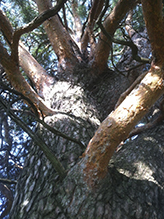 Older trees have a broad, done-shaped or flattened crown. The trunk is sometimes straight, but is often crooked due to growing conditions, pests, and diseases. 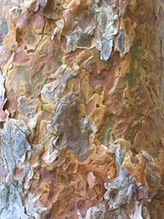 The bark on young trees is orangish-brown and flaky. 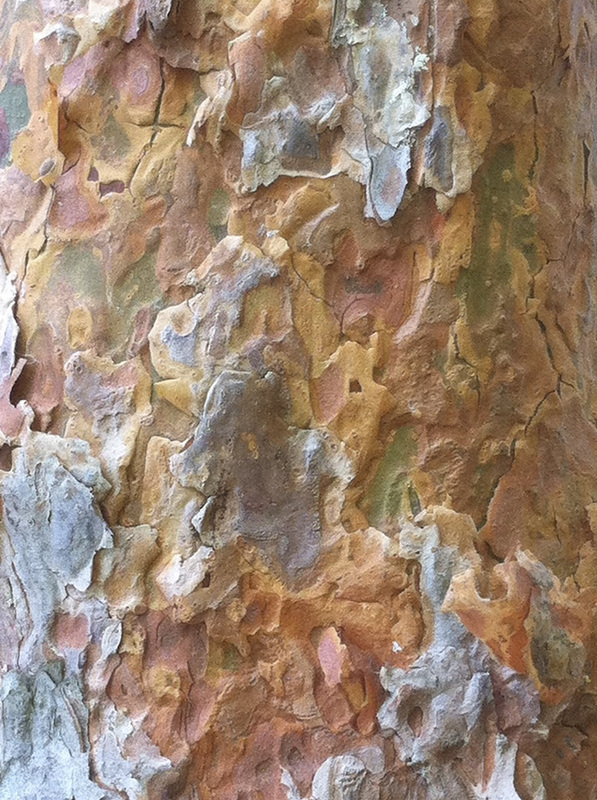 On mature trees the bark on the lower part of the tree is thick, grayish- to reddish-brown, deeply furrowed into irregular, longitudinal, loose, irregularly rectangular, scaly plates, with the brownish-red inner bark revealed between. 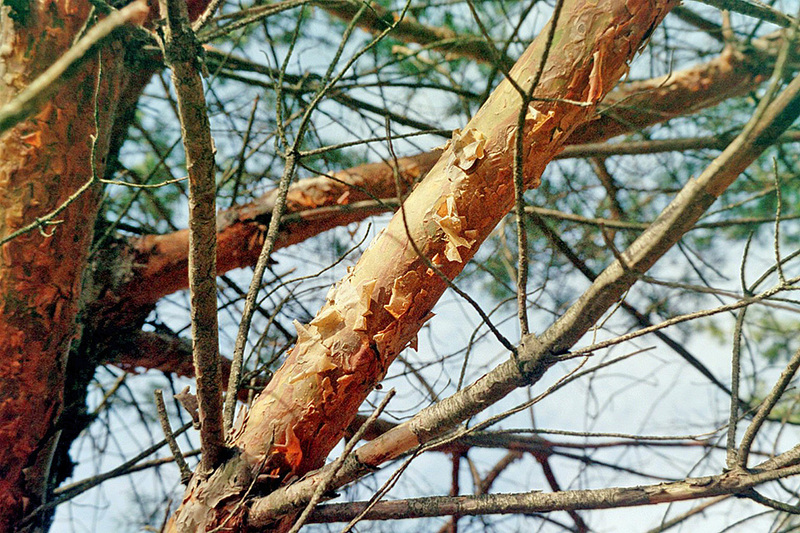 Bark on the upper stem and branches is thin, bright orange-red, and smooth, and peels off in papery flakes and strips. The branches may be slender or stout. They horizontal and whorled, each whorl representing one year of growth. 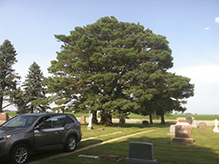 The tree’s age can be determined by counting the number of whorls from the bottom up. The twigs are slender, greenish-brown to orange-brown, not glaucous, grooved, ridged, and hairless in the first year. They become grayish-brown and rough in the second year. The buds are egg-shaped to cone-shaped, ¼″ to ½″ long, sharp-pointed, and covered with overlapping reddish-brown scales. They are usually thinly or sometimes thickly covered with white resin. The needle-like leaves are bluish-green, grayish-green, or yellowish-green, with evenly distributed white dots. They are usually 1½″ to 2½″ long and 1 ⁄16″ wide, but may be up to 3½″ long. They are slightly or strongly twisted, stiff, and sharp-pointed. In cross section they are triangular in shape and have 2 fibrovascular bundles. The white dots are pores surrounded by 2 glaucous cells, and are evident on all surfaces. Needle edges are finely toothed. Needles are borne in bundles of 2 with a sheath at the base. The needle pairs are spreading but are not forked. The sheath is 3 ⁄16″ to ⅜″ long, eroding to 3 ⁄32″ to ⅛″ long as the needles age, but not falling off before the needles. 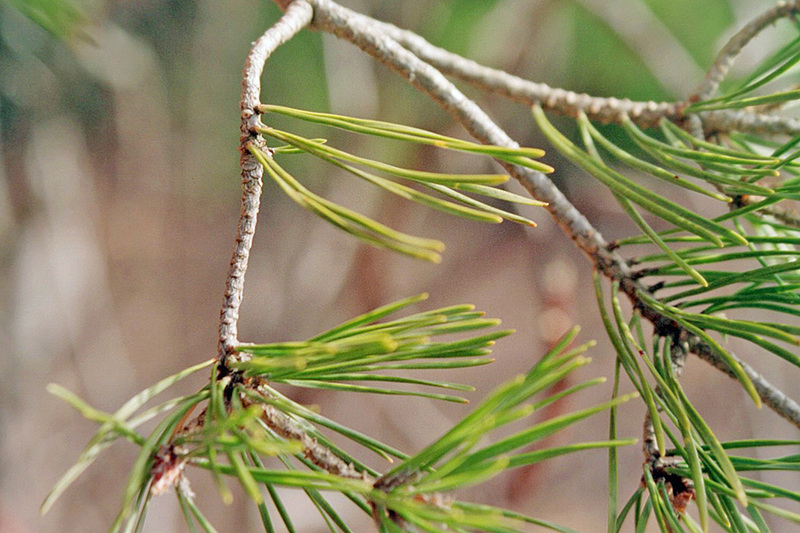 The needles are evergreen, and can remain on the tree for up to 9 years, but usually fall after 2 to 4 years. Male and female cones are borne on the same tree. 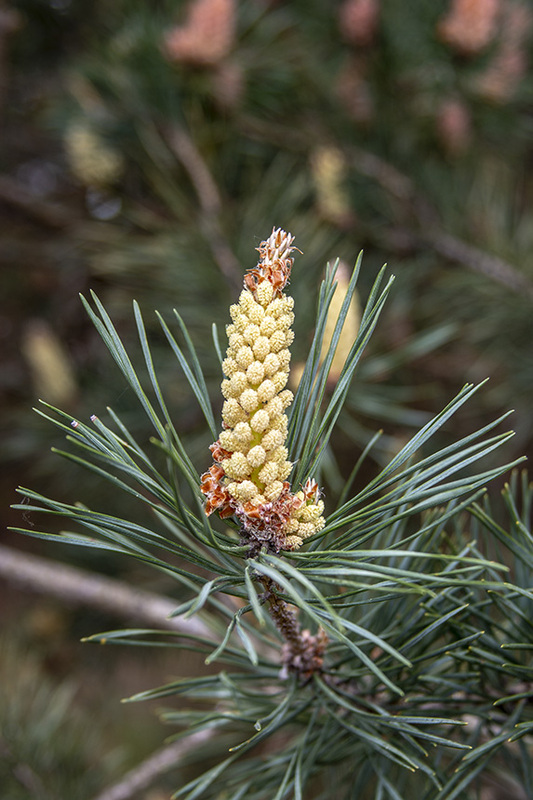 Pollen (male) cones are cylindrical, 5 ⁄16″ to ½″ long, and yellow or pale pink, yellow when shedding pollen. They are borne in clusters on older branches in the lower part of the crown at the base of the new shoots. 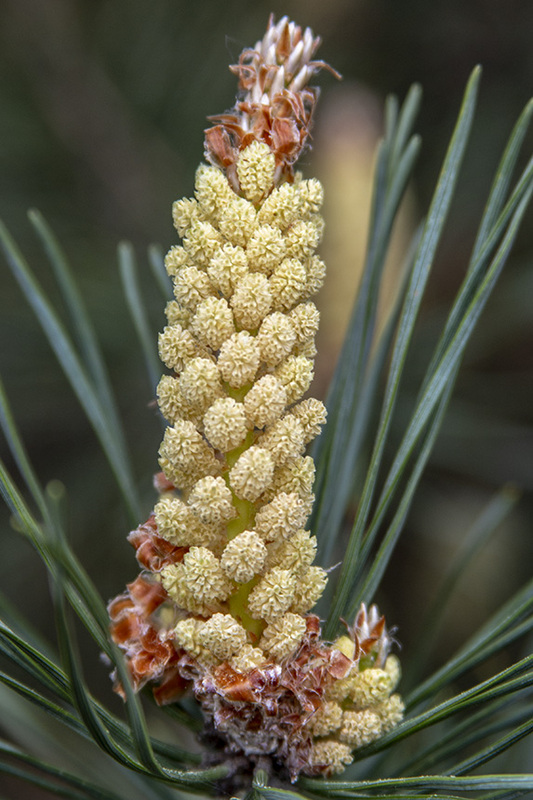 Female cones at the time of pollination are ¼″ long conelets. They are borne usually in clusters of 2 or 3 near the tip of the new shoots. 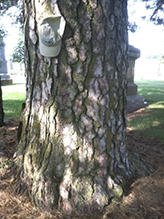 They are usually in the upper part of the crown but may be on any crown branch that receives full sunlight. Pollination takes place over a 2 or 3 day period in late May or early June. Male cones shed pollen then wither and fall away. Fertilization takes place one year after pollination. After fertilization the conelets elongate quickly, reaching full size, 1″ to 2¾″ long, by early summer. Immature seed cones are bright green. 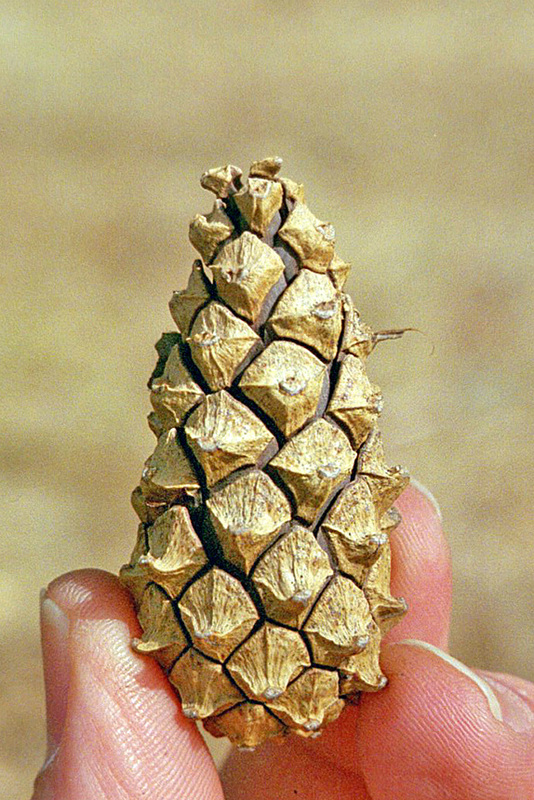 Mature cones are grayish-brown to tan or greenish-gray, cone-shaped to egg-shaped, and nearly symmetrical. They are stalkless or on a stalk no more than ⅜″ long. They point backward along the stem. They are covered with usually 5 spiraling rows of 10 to 16 scales each. The scales at the tip and the base are small and are not fertile. Mature seed cone scales are thin and rounded at the tip. The tip of the scale, that portion that is exposed when the cone is closed (apophysis), is grayish-brown to tan or greenish-gray, slightly raised, and 4-sided (4 ridges). There is a sealing band adjacent to the apophysis where the scales meet when closed. There is a prominent protuberance (umbo) centrally located on the apophysis, where the 4 ridges meet. There is no prickle on the umbo. The scale tip is pressed closely against the next scale, not free. At maturity the scales bend backward, releasing the seeds. Soon after that the cones fall to the ground. The time from pollination tothe beginning of seed dispersal is 20 months. There are 2 seeds in each fertile scale. The seeds are reddish-brown, mottled with black, 3 ⁄32″ to 3 ⁄16″ long, with a 9 ⁄16″ to 13 ⁄16″ long, pale brown wing. The wing is loosely attached to the seed (articulate), and is easily pulled away. 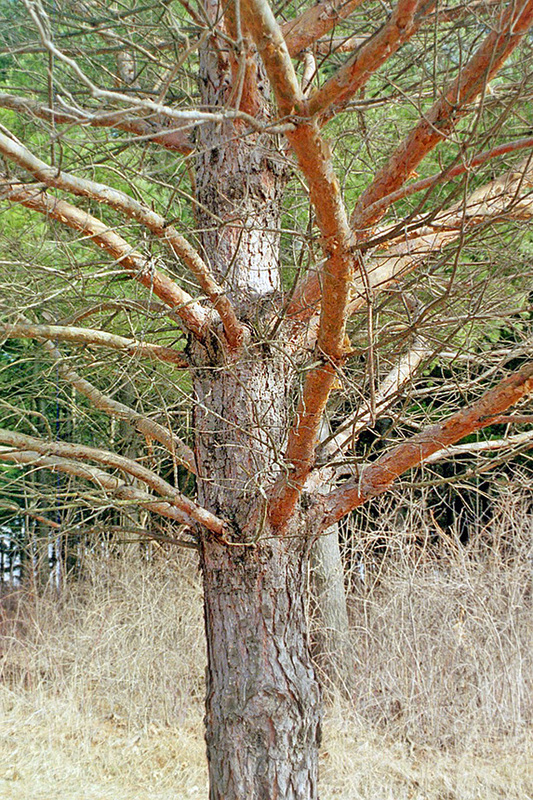 The bright, orange-red bark of the upper stem and branches and the bundles of 2 bluish-green or grayish-green needles distinguish this species from all other pines. Distribution Sources: 2, 3, 4, 7, 22, 24. No state records are kept for non-native species. 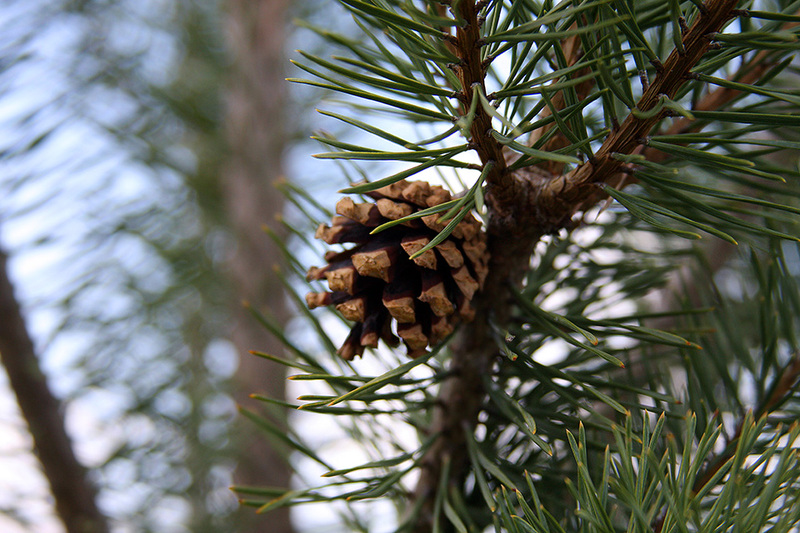 In coniferous trees that portion of the cone scale that is exposed when the cone is closed. It is the second year’s growth of a two year old scale. 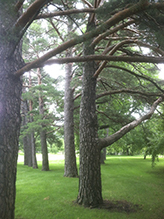 Pines of the subgenus Pinus. They have scales with a sealing band, dorsal umbos, articulate seed wings, and two fibrovascular bundles per leaf. The wood is harder and heavier than that of soft pines. 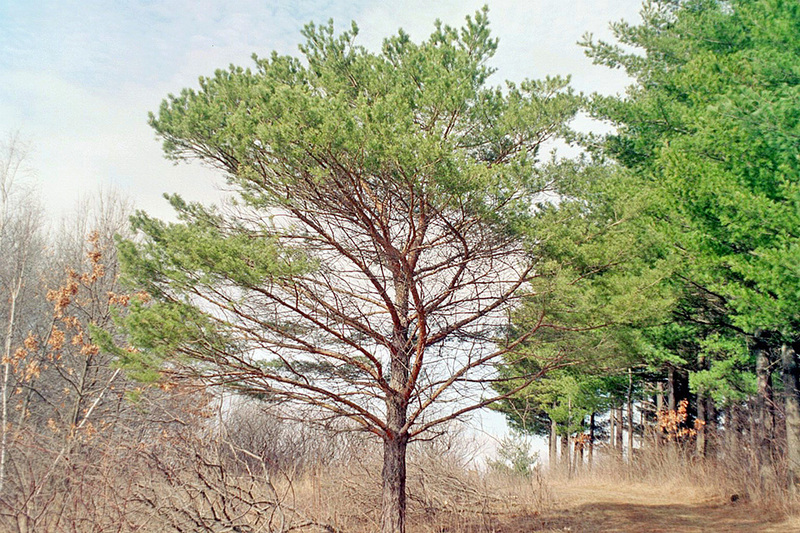 Also called typical pines or yellow pines. (fibrovascular bundle) A strand of the transport system in plants that runs from the roots, through the stems, to the leaves. It consists of xylem on the inside and phloem on the outside. 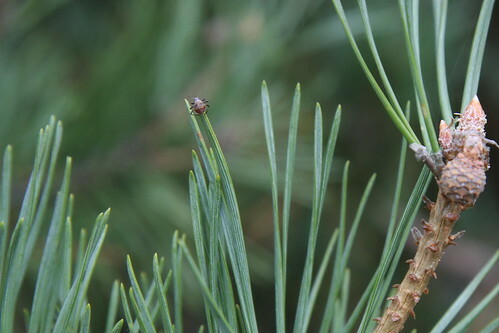 In this growers guide to Christmas tree species, Dr. Bert Cregg of Michigan State University gives an overview of Scotch Pine. For more information on Christmas tree species and their characteristics contact MSU Extension, or visit our website. 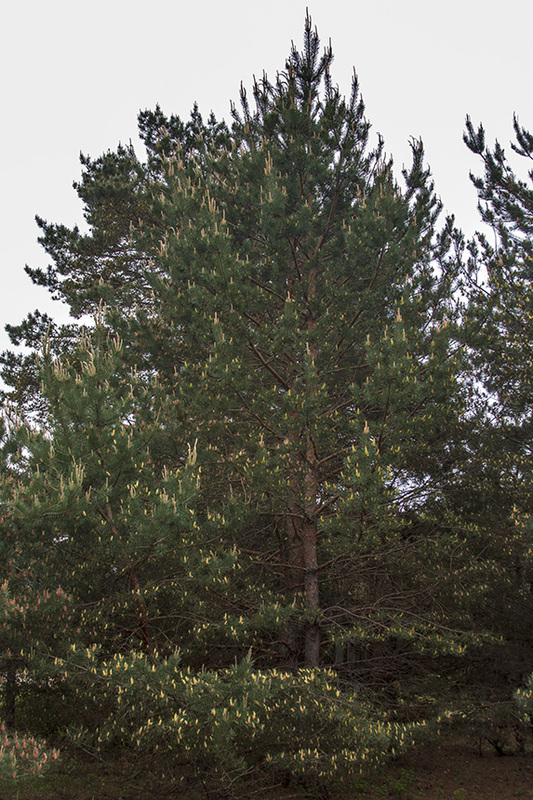 El Pino silvestre (Pinus sylvestris), también conocido como pino de Valsaín, pino Soria, es un árbol autóctono, perennifolio, de la familia Pinaceae. Tiene el tronco recto, llegando a alcanzar gran altura (hasta 50 m). La corteza es fina , de color asalmonado y se desprende en capas. Las ramas se van abriendo en altura, quedando la copa abierta. En los ejemplares jóvenes es muy cónica, recordando los pinos de Navidad, para los que también se han usado. Las acículas, en numero de dos, son cortas, de color verde a verde azulado. La piña es pequeña, alojando dentro las semillas. El pino silvestre es espontáneo pero también se ha utilizado mucho en repoblaciones por el alto valor de su madera.